The fall season is upon us! The days are a little cooler, and the trees are beginning to change colours all around us. These are just two of the tell-tale signs that Thanksgiving is on its way! It is one of the holidays many Canadians look forward to, whether it is celebrated with a large group of family and friends, or if it is more of an intimate affair. What is the way most Canadians like to commemorate this annual occasion? With Turkey! It is usually the centrepiece of this holiday meal. Though turkey is traditionally roasted whole in the oven for this occasion, it is available in so many different cuts at your local grocery store! You can find Canadian turkey sliced, ground, as drumsticks, breasts and even as bacon! If the traditional roast turkey is not what you like to gobble during Thanksgiving, then try one of these other options to make this holiday special for you and start a Thanksgiving tradition with it! My family loves sitting down to a roasted bird every Thanksgiving. Whether it is just our immediate family or if we are amongst a rafter of family and friends, seeing the golden-brown bird presented to the table is what we anxiously await each year. 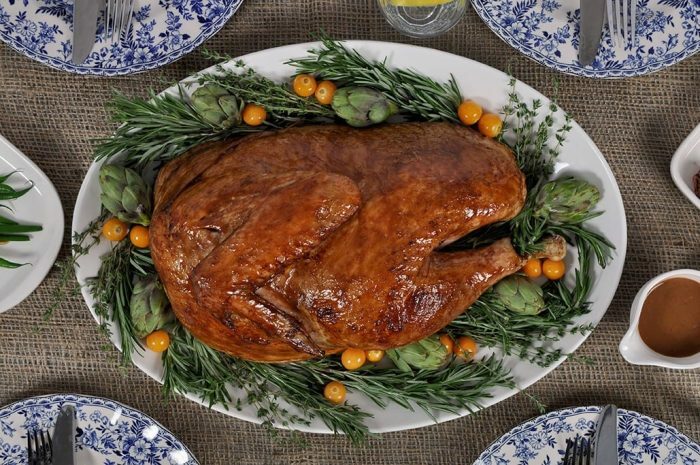 Some people find tackling this big bird a bit daunting, but Canadian Turkey has shared their foolproof Whole Bird How To tips to get your turkey from store to your Thanksgiving table with ease! Worried about what you will do with your turkey excess? They also give some fabulous hints in their recipe section on how to prepare some tasty turkey leftover dishes your family can enjoy for the rest of the week! If serving a large turkey is not in the cards for your family’s needs, Canadian Turkey also has on hand a large library of scrumptious recipes to enjoy a fantastic feast that works for you! Below is a recipe for a Classic Half Roast Turkey to get you fired up about this year’s Thanksgiving meal! If your bird is frozen, place it in the refrigerator overnight to defrost. Remove turkey from the oven and let it rest for 15 minutes before carving. Take your pan drippings and skim all but a few tablespoons of the fat away. Pour into a saucepan. Unpeel the garlic. Add the garlic and half the cooked onion to the saucepan. Blend with a hand blender. Combine 1 tbsp corn starch with ½ glass of milk until dissolved. Add to the saucepan. Stir over medium heat and bring to a simmer. Lower the heat until mixture thickens and serve in a gravy boat. Want to find fun and unique ways to prepare turkey this Thanksgiving? Pop over to Canadian Turkey’s website to see the recipes they have in store for you to try, savour and make into a #CDNTradition! For more information about Canadian Turkey, you can connect with them on Facebook, Twitter (Hashtag #CdnTradition), YouTube and Pinterest pages! Canadian Turkey would like for one lucky Ottawa Mommy Club follower by giving away one (1) $75 Amazon Gift Card to help make a fabulous Thanksgiving meal this year! This giveaway is open to Canadian residents and ends at 11:59 EDT on October 7, 2016. I’d like to try the Butter Turkey recipe. Would never have though to try that, clever idea for a substitution! My turkey recipe is a great meal solution negative it is versatile and can be used for leftovers for a few days. I would like the TURKEY TACO PIZZA, would be great for Friday or Saturday night!! The Sweet and Spicy BBQ’d 1/2 Turnkey would be perfect for us and leftovers would go into sandwiches for the next day. My favourite turkey meal is the classic roasted turkey with stuffing inside. It is a meal that everyone loves and so much you can do with the leftovers! I love the recipe for Sweet & Spicy Oven-Fried Turkey Drummettes, it would be great for my family because my daughter loves drumsticks and I’m always looking for new ways to cook them! This prize is great timing because our son.s birthday is close to Thanksgiving so we always have a turkey dinner close to his birthday. The Weeknight Buffalo Turkey Tacos would be a great addition to our recipe rotation for dinner! With 15 minutes for prep and plenty of tastes and ingredients my entire family would enjoy, this is a great mealtime solution for me! The grilled Turkey Breast with Mushroom and Wild Rice Stuffing provides a great meal solution for my familybeacuse It’s a nutritious meal. It provides a great meal solution because it is economical and so versatile. My family would love the Shredded Turkey Tacos recipe. My favorite roasted stuffed turkey provides a few healthy meals for my family paired with veggies. I do turkey dinner. From the leftovers we make delicious turkey soup and turkey sandwiches. We love our family favorite recipe. We call it WTF Casserole. LOL. It’s a delicious meal containing all the Thanksgiving leftovers. It’s different every but always delicious and convenient. we love turkey for thanksgiving it’s a tradition! I love making turkey wraps from all the leftover turkey we have after thanksgiving! I think we need to eat more turkey! My favourite turkey meal is the just roasted turkey with stuffing inside. Turkey is a great way to save as you can serve it so many ways. The Sweet & Spicy Oven-Fried Turkey Drummettes recipe would make a good meal solution for my family because we enjoy Turkey Drummettes. My favourite turkey to make is a large roast turkey and the reason it provides such a great meal solution for my family is because it continues to feed us for so much longer than just one meal. Everyone loves it out of the oven, even my toddler who doesn’t like most meat, and then we love to make turkey sandwiches for our lunches over the next few days, and after that I love to make a turkey soup for another easy and delicious lunch and dinner option. I love that a roasted turkey provides so many options with the leftovers, but I think the Sweet & Spicy Oven-Fried Turkey Drummettes would make for a tasty & fast alternative to chicken wings on a busy school night! I think the shredded turkey tacos would be perfect for my family because they love tacos and it’s a great way to use up leftover turkey. A healthier alternative to chicken nuggets is definitely the Honey Garlic Turkey Tenders with sweet & smoky dipping sauce. I like turkey because it’s leaner & this recipe uses wheat & oats for the breading which is baked & that means a perfect healthier meal for my family. we love making a hearty chili with turkey. It’s such a nice lean cut of meat and I prefer it to beef, plus it freezes really well so we can make a huge batch with lots of leftovers! My favorite recipe is The Smoked Turkey Wraps.It is a great meal solution for my family because they are quick and easy to make and can be made ahead of time. The Thai Turkey Wonton Cups would be perfect for us. We love Thai flavours and turkey. We could have these for dinner with a salad and my hubby could take the leftover cups to work in his lunch. It is a great meal solution because it is lean meat but full of flavour! I like a roast turkey using leftovers for hot turkey sandwich with mushroom gravy. I’m always on the look out for a good salad roll recipe. The Shredded Turkey Stuffed Salad Rolls With Easy Peanut Sauce will surely become a favourite at our place. SLOW COOKER TURKEY CHILI WITH SWEET POTATO, CHIPOTLE AND MAPLE would be a great meal to make for our family to eat when they are ready on the weekend. My favourite turkey recipe provides a great meal solution for my family because all of use LOVE turkey and enjoy eating as a family! My favourite recipe there is the nicoise salad, because its versatile: protein and veg in one delicious dish. The SWEET AND SPICY BBQ’D ½ TURKEY ON THE GRILL recipe sounds good and having never tried grilling Turkey it would be a great recipe to try. Our entire family can’t wait for a turkey dinner to eat the leftovers. Our favourite recipe is turkey shephards pie. We always cook a really big turkey and extra potatoes and veggies and make a couple of shepards pie. One to eat that week and one to freeze for later. I like Club House sandwiches but I like it with a slice of turkey I’ve cooked and not deli turkey which I don’t think has a real turkey flavour. The Turkey Chili is a great recipe for our family because it’s easy to put together, feeds quite a few, and leftovers are great! Turkey is a Thanksgiving tradition in my home. We love turkey flatbread. They are delicious and everyone can choose their own toppings! I love making turkey burgers with fresh ground turkey. I love that they are easy to whip up for a weeknight meal, these burgers are light yet satisfying. The slow cooker turkey breast makes a great fix-it-and-forget-it meal! The Snow Pea, Green Bean and Turkey Stir Fry with Orange Ginger Sauce provides a great meal solution for us. It uses favourite flavours, is a stir fry which is a favourite thing, and includes several vegetables. I love Turkey! It’s delicious, healthy and easy to cook. My favourite recipe, which is Slow Cooker Turkey Breast, is wonderful for a quick family dinner. It’s one of those meals you can set in your slow cooker and not worry about; you can go about your life, do your work and return to a warm, healthy meal. The best turkey recipe is one that is quick and easy so you can spend more time with family and less time in the kitchen. Moroccan Spice-Rubbed Turkey Wraps as it tastes good and we all enjoy it and lots of flavour. The sweet & spicy oven-fried turkey drummettes makes a fun and tasty meal which is always a favourite for my family. The smoked turkey wraps are a great meal solution as they are quick to make and simple enough for my kids who can be picky eaters! Our favourite turkey meal is roasted turkey with homemade stuffing. It’s a classic and I love it! Leftovers make lunchtime very easy. My family would enjoy the Turkey Breast with Mushroom and Wild Rice Stuffing. It would be low in fat and provide an excellent source of protein. We love frying the whole turkey. Its easy to make and the crunchy skin is our favorite. I like the turkey club with spicy mayo. My family always prefers next-day turkey sandwiches anyway, and this one looks like it has a kick. With a side of my famous stuffing we’d be so good to go for a few days. My favorite is the turkey pot pie I make with our leftovers from thanksgiving! My favourite turkey meal is roasted turkey with stuffing, vegetables and gravy. Its a great solution for my family as its something everyone will eat and we can enjoy together. The BBQ ESPRESSO-CHIPOTLE TURKEY RANCH NACHOS recipe would be an excellent recipe for our family dinners. We love doing finger food nights and this would be an excellent way to use up any left over turkey. My turkey recipe can be made ahead, tastes wonderful and allows for plenty of leftovers and turkey soup. The sweet and spicy turkey drummettes would be great for us, we always have a crowd and we could make a large batch of these in advance! My favourite is roasted turkey. It is so versatile. We eat is part of a big meal the first day and use the rest as leftovers in sandwiches, stews, soups, etc. The bbq turkey club would be an awesome lunch for everyone! The slow cooker turkey breast – I love coming home to dinner in the crockpot! I would totally want to try the Moroccan Spice-Rubbed Turkey Wraps – always so much leftover turkey and this would be perfect for the day after!!!! I put the turkey on a bbq and use fruit woods for smoke. The turkey is almost fat free which is good for everyone. It makes cooking together more fun for me and my child! We love the Turkey tacos! It’s perfect for the whole family, protein balanced out with veggies and a taco wrap. Everyone is always excited for Turkey taco night, I slice and dice everything, put on the table and everyone does their own! Lots of fun! our favourite is the left over turkey ,stuffing and cranberies in toasted sandwiches covered in gravy! Turkey can be prepared in so many ways so once I’ve made a roast turkey dinner, I know I can also make leftover turkey sandwiches and a pot of turkey soup. It means I don’t have to figure out meals for a bit and that helps a lot. We would enjoy the SWEET & SPICY OVEN-FRIED TURKEY DRUMMETTES as we like to spice things up around here. The BBQ turkey club with spicy mayo. Hubby would loves that twist. Turkey taco pizza sounds like a great idea for leftovers! I love Turkey anyway its made but the Smoked Turkey Wraps sound delicious! The Smoked Turkey Wraps are perfect for my family because we can each personalize them to our liking. Our turkey recipe is great because everyone likes it and we have leftovers for a long time! Our family turkey soup recipe is always comforting, nourishing, and the perfect end to the day. The Sweet & Spicy Oven-Fried Turkey Drummettes is great for my family because they like to eat with their hands. I really like turkey taco pizza recipe as pizza is always a hit! We love everything turkey because it’s so deliciously juicy and healthy. The Smoked Turkey Wraps would be enjoyed by my family and everyone could add their own sauce or mayo to them with different vegetables too. We would love to try the Turkey Taco Pizza! SLow cooker turkey breast is a nice practical solution ans meals oit of crockpots are always so simmered and tastey! The Turkey & Mozzarella Stuffed Veggies are great for my family because they’re delicious and they have the perfect amount of veggies and meat in it. They are great to take to school or work for lunch. Shredded Turkey Tacos would be a nice switch from our usual leftover recipes. The Caesar Turkey Schnitzel Sandwiches provide a delicious ,fast, and simple meal for my family allowing more time together instead of in the kitchen. The Smoked Turkey Wraps would be the perfect meal solution as it would be quick to make and get on the table and it is something the whole family would enjoy eating. A healthy meal that the whole family will love! we make a delicious turkey chili and get to load it up with a ton of veggies, and the kids eat every bite and ask for seconds. win win! Smoked turkey wraps, so easy to make and delish! We would enjoy the smoked turkey wraps here. The grilled turkey taco bowl is a great solution because it provides a healthy meal for the next day after thanksgiving! The Grilled Apple and Honey Turkey sounds amazing! Turkey chili would be perfect for a fall day! I am going to have the butcher cut a nice fresh turkey in half and prepare this recipe – the size will be perfect and easier to cook correctly. The DELICIOUSLY SIMPLE HERB ROASTED TURKEY would be great for our family Thanksgiving dinner. The shredded turkey tacos would be great for my family. We all love tacos,and they could make a quick lunch,snack,or do as a meal! My favourite recipe, the Cherry Orange Stuffed Turkey breast, provides a great meal solution for my family because it’s healthy, nutritious and something that every member of the family would thoroughly enjoy. We like to do a traditional turkey, leave aside enough for turkey sandwiches and use the rest in a turkey casserole that uses the leftover potatoes, veggies, stuffing and gravy. It’s delicious and means that your Turkey meal doesn’t go to waste! The twice baked turkery dijon stuffed potatoes would be awesome for the two of us. Whether as meal with added protein or as a side dish! The Grilled Apple and Honey Turkey is great for my family since we enjoy healthy foods. The Warm Turkey and Root Vegetable Salad would be great for my family, especially because it has lots of healthy veggies! The Classic Roasted Half Turkey is a great solution for my family as it’s easy to make and everyone loves it. I love the nutritious recipes on the Canadian Turkey website. A great way to use up the leftover turkey! Our favorite way is to eat turkey in sandwiches because everyone eats them. Every my picky kids. My family loves turkey ANY way. However its prepared just contributes to the turkey experience. Happy Thanksgiving! It provides a great solution for my family because we all love a turkey meal and all the meals you can make with the leftovers. Sweet Chili & Lime Turkey Meatballs. We love meatballs.